You might not know this little GIAG fact, but probably the first “name” title I ever looked at for the site was the glorious fabric-woven Kirby’s Epic Yarn for the Wii. God knows how many moons later and here I am again with the splendidly monikered Triple Deluxe – a game that sounds remarkably like a delicious hamburger. Rather than clogging your arteries and dripping with oozing grease, the latest outing for the cutesy, transmorphing pink fella is a healthy treat for the soul and the senses, that perks you right up from the moment you start playing. It may lack the supreme gimmickry that set Epic Yarn apart from all other adventures in and around Dream Land, but it’s certainly worthy of your hard-earned cash. HAL Laboratory guide you in beautifully with a charming introductory sequence that explains what is going down to spark off the latest shenanigans in Dream Land. This time out, young Kirby is woken from his slumber to find that his home and everything around it – including the castle of his arch-nemesis King Dedede – has been hoisted up into the ether by an enormous beanstalk. We find out soon enough that this is the work of a crazed insectoid creature called Daranza – who sounds like a Brazilian centre forward but is in fact hell-bent on messing Dream Land up left, right and centre – and that includes taking former badass number one Dedede hostage. Of course, it is up to the puffball with attitude to inhale things right again – and your job to guide our hero on a mission to restore order to Dream Land. You do this by usual Kirby means – jumping, floating and sucking things up to absorb their abilities – on a gorgeous 2.5D platforming plane. There is a crazy amount of abilities to be absorbed this time out – including old favourites like fire, swords, speeding wheel and cracking whips – as well as some ace new ones like the Rhinoceros Beetle and the unusual yet effective Bell, which allows you to weild two bells as weapons that can beat enemies upside their head, shield the puff ball from attacks or generate sound waves that stun baddies. 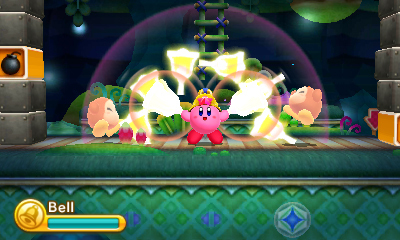 New to the Kirby-verse is the ability to enter Supernova form, wherein Kirby can inhale huge objects and chunks of scenery, which are usually incorporated into basic yet fun push ‘n’ pull puzzles. At times you can jump in and out of the screen between two planes, even shooting cannon balls from the foreground into the distance to clear objects and destroy enemies. It works brilliantly with the stereoscopic 3D element. I particularly liked seeing a huge gloved hand on a spring squish Kirby into the screen, but that doesn’t make me a bad person. Like any platformer worth its salt, Triple Deluxe (man, I could go for a burger right about now) has a number of collectibles. Each stage has three stars to find, some of which can be quite tricky to locate. Each sequence of stages is rounded off by a boss battle, with some unique and genuinely fun encounters to be had. There are also a shedload of collectible keychains, fashioned after objects and characters from Kirby games past and present. It is a genuine thrill when you find hidden keychains, particularly as they are rendered graphically in the same style as their source. You can also purchase one of the 250+ chains using Play Coins or pick them up using StreetPass, so make sure you start taking your 3DS out and about with you to build these up regularly. Longevity is also found in the remarkably generous additional content. King Dedede’s Drum Dash is a reasonable rhythm-action based platform minigame which provides a welcome break from the normal Kirby fun. But Kirby Fighters is the champagne inclusion, a pared-down version of Super Smash Brothers in which you can select and assign a Kirby with a specific ability and then enter into SSB-style brawls on stages based on classic Kirby levels from ages past. 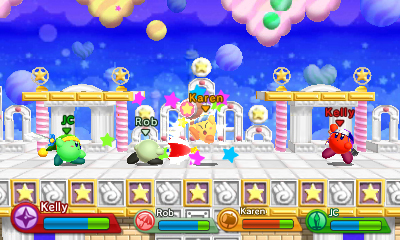 Supporting download play and four-player scraps, Kirby Fighters is a ridiculously generous minigame that could have quite easily been flogged on its own as an eShop download. 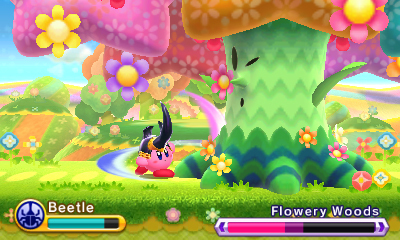 Throw an additional Arena boss rush mode on top, and you will be spending many hours with ol’ Kirby, once you have iced the 4-5 hours it should take you to defeat Daranza once and for all. 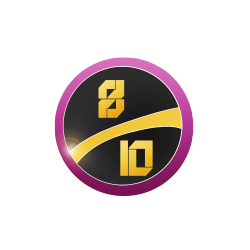 VERDICT: Triple Deluxe is a solid platformer bookended by some great extras, even if it is pretty easy, give or take a couple of tricky boss encounters. It lacks the sense of wonderment that Epic Yarn generated with its incredible use of texture, humour and verve, yet is still well worth a look -and is perhaps the finest handheld outing for the cerise sucker. Another understated triumph for Nintendo, then.